SOMALIA—Somali-based al-Shabaab militants have ambushed and killed Ugandan soldiers serving on the African Union peacekeeping force in south-west of Mogadishu. However the militants claimed they had killed 39 Ugandan soldiers serving under Amisom. This news website could not independently verify the claims. Brig Karemire said the soldiers that fell under the ambush were conducting a joint patrol under 7th Battalion of Battle Group 22. A platoon is a military unit typically composed of two or more squads or patrols, typically comprising around 40 to 50 soldiers. The extremist group claims that they have killed 39 soldiers…. The incident took place at Gorowen between Bulumaler and Beladamini in Lower Shabelle region, about 140kms south-west of the capital Mogadishu. “The troops equivalent of a platoon plus were conducting a regular patrol to secure the Mogadishu Barawe Main Supply Route, which still harbours pockets of Al-Shabaab insurgents,” Brig Karemire said in a statement on Sunday. A car bomb blast near a police station in 's capital on Sunday killed at least 8 people and wounded at least 13 others, police said. “We salute the gallant officers and men who have made sacrifices to ensure that peace is restored in Somalia,” Brig Karemire said. But the al Qaeda-linked Al Shabaab terrorist group often targets high-profile areas of Mogadishu, including hotels, military checkpoints and areas near the presidential palace. The insurgents have been largely pushed out of the capital Mogadishu following UPDF incursion and sustained peacekeeping efforts under the auspices of Amisom. 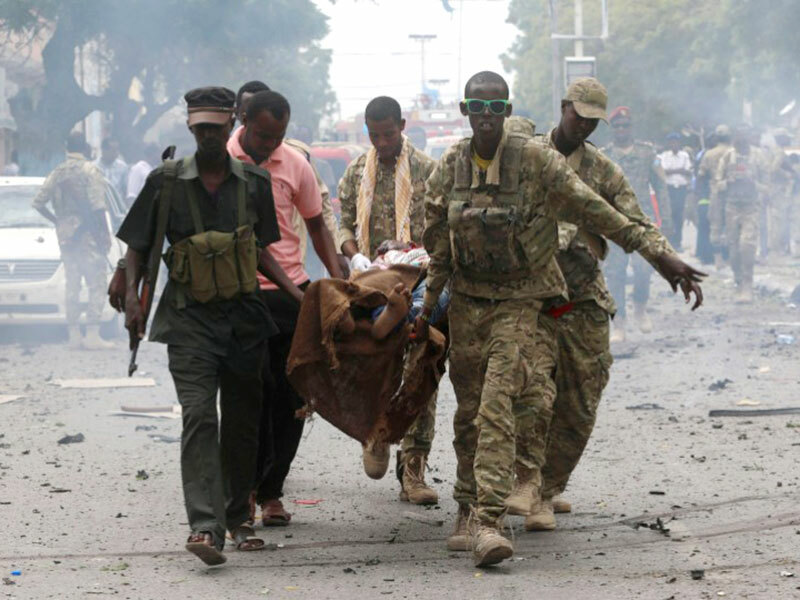 Meanwhile, news reports say at least six people were killed in a car bomb that ripped through a busy road in Somali capital Mogadishu on Sunday. Police said the death toll could rise as the explosion also left 20 more wounded. The bomb went off on Maka al Mukaram Road, police said, while a witness said the blast was followed by big clouds of smoke visible in the sky. Photographs showed three destroyed cars on the road, with two still burning. It was not clear who was responsible for the blast.